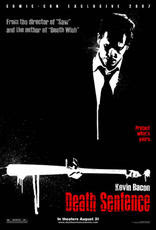 Death Sentence stars Kevin Bacon as Nick Hume, a deceptively passive exec whose wife and children are attacked in a sadistic, gang-related hazing rite, and his oldest son killed. Hell bent on cold-blooded vengeance, Hume pulls a Bronson by tagging each of the perpetrators, then tracking down and rubbing out each one, with the help of formidable, blue-steel artillery. Aisha Tyler co-stars as the homicide detective who first agrees to assist Hume in his mission, then begins to edge up to the conclusion that the unstable father himself might be responsible for the nasty crimes against his family. Kelly Preston co-stars as Bacon's wife, Helen Hume; the cast also features John Goodman (The Big Lebowski), Leigh Whannell (Saw) and Matt O'Leary. Ian Jeffers loosely adapted Brian Garfield's popular 1975 novel.